It is not appropriate to move or obstruct access to an interior landmark to make way for private development, a request that seems to be on the rise as we saw last year with the clocktower at 346 Broadway. Approval of this application will be a clear communication of conscience, and indicative that our culture and art is merely secondary to a Times Square corporate chain store. Proponents argue that the move allows both ground floor retail and expanded space for theater. 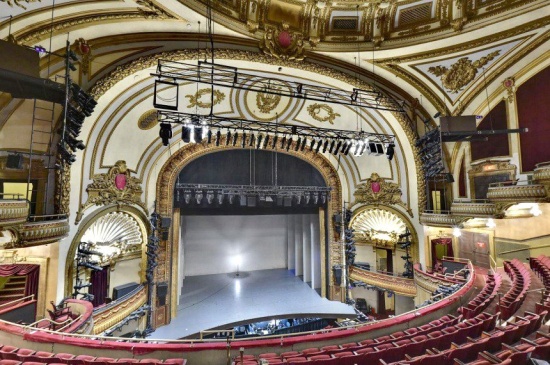 Moreover, the Palace's interface with the street will be enhanced by the move, as the sidewalk on Seventh Avenue is too busy for theatergoers to linger around pre- and post-show. There's no word yet on dates for the move. This weekend, 256 public and privately-owned sites across New York City will open their doors to thousands of architecture and history nerds for the 13th annual Open House New York (OHNY) Weekend. All sites are free to visit, though some require registration in advance. Gregory Wessner, executive director of OHNY, said the event is an "opportunity to get an audience to look at the city through different disciplinary lenses." This year, 1,200 volunteers will staff 256 sites. Wessner explained the selection criteria: sites are evaluated for their architectural, cultural, and historical significance; location; proximity to public transportation; period, style, and typology. Last year, OHNY Weekend attracted approximately 75,000 visitors over two days. 80 percent of those visitors were New Yorkers. Given the depth and breadth of the offerings, it's impossible to privilege one site over another, though Wessner said he's particularly excited about City Hall. 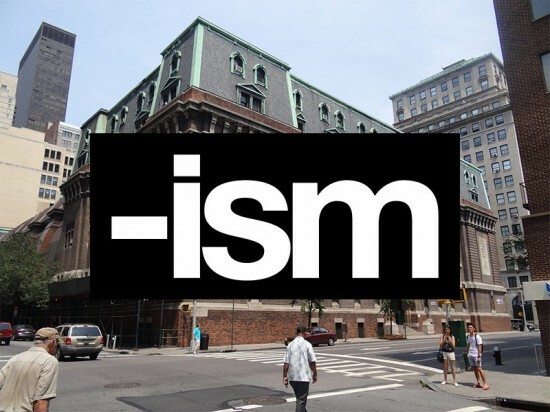 City Hall, he believes, "represents what's great about OHNY. It represents the seat of government, which most of us don't get to go into, and welcomes the public to go in and look around." New York's Beyer Blinder Belle renovated the palatial 1812 structure this year. 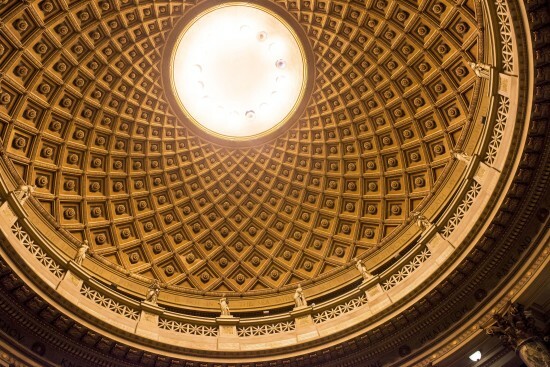 A little-known architectural mecca is Bronx Community College. From 1959–1970, New York University (then owner of the campus) commissioned Marcel Breuer to design four buildings. DOCOMOMO New York/Tri-State will lead tours of Breuer's buildings on Saturday and Sunday. Also on campus: the Beaux-Arts Gould Memorial Library and Hall of Fame (Stanford White, 1900) and North Hall and Library (Robert A.M. Stern, 2012). Though the weekend is the group's biggest event, OHNY operates throughout the year, organizing tours and talks to encourage dialogue around major issues affecting the city's built environment. The Final Mile is a yearlong exploration of the "challenges and choices for an equitable and resilient food system" in New York. Food manufacturing, Wessner stated, is the fastest growing manufacturing sector in the city, and drives real estate development (think Smorgasburg and Chelsea Market). Tomorrow, Friday, OHNY is leading tours of food manufacturing facilities as a lead-up to the weekend. Visitors should check the OHNY Weekend for updates ahead of their trip. See the gallery below for more images of featured sites. "I love it," said another passerby. "I want good things to happen here." The content of displays shall be City-approved government speech. This ordinance does not open the east facade of City Hall as a public forum, or non-public forum, for nongovernmental speech, nor shall it be open to general advertising signs. The rooftop installation of two projectors on Asian Arts Museum and the Main Public Library comes with $1.5 million price tag. 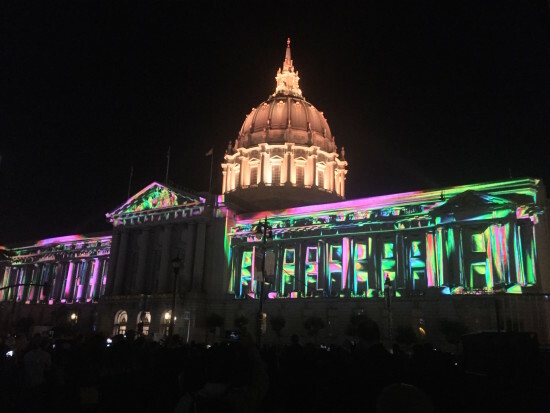 The cost would be covered by a private fund related to San Francisco’s Centennial Celebration. All aspects of the installation on the historic buildings require review by the Historic Preservation Commission. Kansas City's main rail station will get a $7.5 million expansion and streetscape improvement, local officials announced this week, including a new bridge designed to improve circulation between the terminal's “front and back yards.” Union Station was built in 1901, but its last major renovation was in 1997, when a major renovation closed the Beaux Arts building—which is on the National Register of Historic Places—for two years. Now KC-based Burns & McDonnell, picked by the Union Station board after a “rigorous” review process, will guide the redesign, renovation, and reconstruction of the local landmark's outside areas. A $2.25 million tax credit from the Missouri Development Finance Board kicked off fundraising for the project, which topped off only after a recent gift from the Bloch Family Foundation. The Hall Family Foundation covered more than half of the total project cost with a gift of more than $4 million. 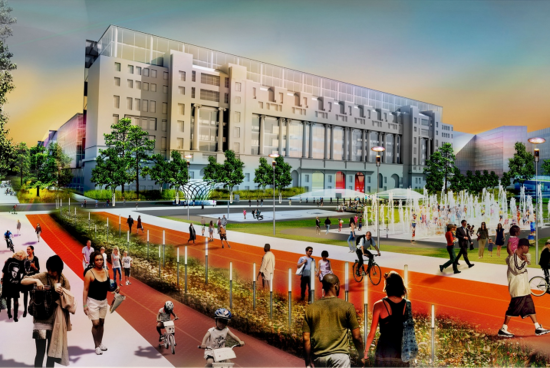 The new landscape features include a bridge for cars and pedestrians connecting Union Station's various outdoor spaces to its parking garage. New spaces include an outdoor events plaza to the west of the adjoining Science City for interactive exhibits and community-based events. Officials hope to complete the project by 2017. As head of the architecture department and distinguished professor at the University of Arkansas Fay Jones School of Architecture, Marlon Blackwell was uniquely qualified to oversee the renovation and expansion of the school's home, Vol Walker Hall. To unite the school's landscape architecture, architecture, and interior design departments under one roof for the first time, Blackwell's eponymous firm designed a contemporary west wing to mirror the east bar on the existing Beaux-Arts style building, constructed in the 1930s as the university library. But the Steven L. Anderson Design Center—which tied for Building of the Year in AN's 2014 Best of Design Awards—is more than a container for 37,000 square feet of new studio, seminar, and office space. It is also a teaching tool, a lesson in the evolution of architectural technology writ in concrete, limestone, glass, steel, and zinc. "Our strategy was to create a counterweight to the existing building," explained Blackwell. Rather than a layered steel-frame construction, Marlon Blackwell Architect opted for a post-tensioned concrete structure to convey a sense of mass and volume. "We also wanted to demonstrate what you can do with new technology like post-tensioned concrete, such as introducing a cantilever and introducing a profile that has minimal columns in the spaces," he said. "All of that is a didactic tool for our students to contrast and compare with the load-bearing technology of the existing structure." The exterior of the Steven L. Anderson Design Center also reflects on changes to architectural practice during the last 80 years. "We really wanted to develop a strong profile of the building, in contrast to Vol Walker Hall," said Blackwell. He describes the effect as a figure-ground reversal: where in the older structure the mass of the building is the ground and the windows and ornament act as figure, in the new wing the mass is the figure and the fenestration the ground. 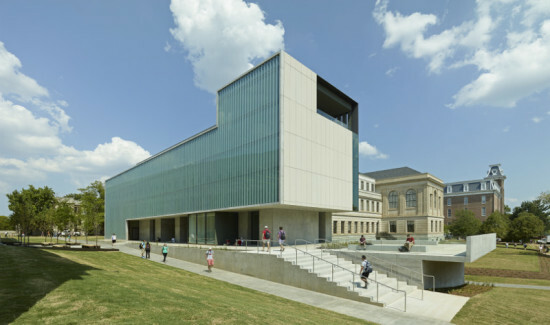 To create what Blackwell terms a "condition of resonance" between the Design Center and Vol Walker Hall, the architects engaged Clarkson Consulting to develop an architectural concrete to match the color of a local Arkansas limestone no longer available. 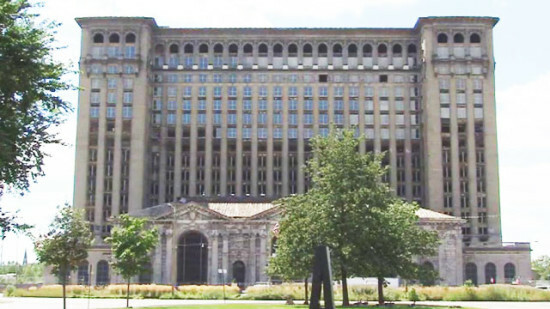 They echoed the Indiana limestone on the older wing with panels sourced from a quarry only 50 miles from the original. But instead of grouting the limestone cladding on the new wing, Blackwell chose a limestone rain screen system from Stone Panels. "That allows us to go much thinner but much larger," he said. "Again, we're using the same materials but showing how the advancement of technology allows for a different expression of architecture." The defining feature of the Design Center is the more than 200-foot-long glass and steel curtain wall on the western facade. Knowing that the western exposure would provide the only source of natural light for the new wing, the architects worked to balance the need for light against the threat of solar gain. To complement the existing building, they chose a fascia steel curtain wall custom-fabricated by local company L&L Metal Fabrication. With curtain wall consultants Heitmann & Associates, Blackwell developed a brise soleil comprising 3/4-inch by 18-inch frit glass fins, angled to filter sunlight into the Design Center's 43-foot-deep studios. "What we like about it, too, is that it's one big window," said Blackwell. "It allows it to feel as if we've cut a section right through the building. At night the entire facade becomes a beacon, allowing for a nice interface between the school of architecture and the rest of the community." Other details, including the monolithic concrete pours designed to lighten the Design Center's connection to the ground, and zinc cladding used on the top floor to sharpen the profile of the main body, continue the dialogue between the new structure and its Neoclassical neighbor. "There are a lot of little things that give a tautness to the expression of the new addition, and give it its own identity," said Blackwell. "But at the same time, one of the things we were faithful to was trying to analyze and uncover units of measure and proportion on the old building, and apply that to ours." Perhaps more importantly, the building works as a design school—and Blackwell would know. "There's certainly contrast on the outside," he said. "But there's an almost resonant seamlessness on the inside." In 1913, the 69th Regiment Armory in Manhattan hosted what was then considered the most shocking art exhibition the public had ever seen. The International Exhibition of Modern Art, which came to be called The Armory Show, introduced modern European art to an East Coast audience. A showcase of -ism art movements then in development and exploration by artists now considered masters of their craft, the event was transgressive; it induced backlash from several publications and from former President Theodore Roosevelt who commented that “the lunatic fringe was fully in evidence.” Yet, even in his blatant dislike of the artworks displayed, President Roosevelt admitted the importance of the show’s existence, its revelation of the European “art forces that cannot be ignored.” This Saturday, September 28, in a centennial homage of the show that shocked the American world, the Architectural League of New York is hosting their annual Beaux Arts Ball in the same venue. Taking inspiration from a space originally meant for National Guard trainings and military activities, the ball will work with and within the great hall to transform its appearance, shockingly. (And tickets are on sale now!) Designed in 1903 by the architecture competition-winning firm Hunt & Hunt, the 69th Regiment Armory reflects the Beaux Arts style, featuring a sweeping hall with exposed interior structure and a symmetrical brick façade covering its exterior. According to Situ Studio, the environment created for Arch League’s 2013 Beaux Arts Ball will feature “an array of tensegrity structures that will rise above and dip below and existing cable grid datum 20 feet overhead.” This array includes an artistic matrix of sculptural, yet lightweight, fabric shapes that will float above partygoers. Accompanied by responsive lighting by Renfro Design Group, a performance of huge Processional Arts Workshop puppets, and sound installation by Nathan Halpern, the event will recreate the 28,000 square feet civic space as a completely different environment, a modern version of the inflammatory Armory Show that transpired there a century ago. Celebrate your favorite -ism at the party of the year. The Architectural League of New York’s 2013 Beaux Arts Ball September 28, 2013 9:00PM - 1:00AM 69th Regiment Armory at Lexington Avenue New York City For tickets, go to: archleague.org/2013/09/beaux-arts-ball-2013 Beaux Arts Ball 2013 - Design Preview from Situ Studio on Vimeo. Classically trained sculptors breath new life into four 20-foot angels with the help of Rhino. When Old Structures Engineering engaged Boston Valley Terra Cotta in the restoration of the 1896 vintage Beaux-Arts building at 150 Nassau Street in New York—one of the city’s original steel frame structures—the four decorative angelic figures, or seraphs, that adorned the corners of the uppermost story were in serious decay. “Up close, they were in an appalling state,” said Andrew Evans, engineering project manager. “The biggest issue we had with the angels was understanding what happened with the originals.” The seraphs were carved from stone by Spanish immigrant Ferdinand Miranda in 1895 and had suffered years of exposure and improper maintenance. By the time the facade was up for rehabilitation, the angels were haphazardly strapped to the building with steel bands and supported with bricks. Their state was such that repairs would not suffice and Boston Valley’s artisans began the task of recreating the 20-foot-tall Amazonian figures. 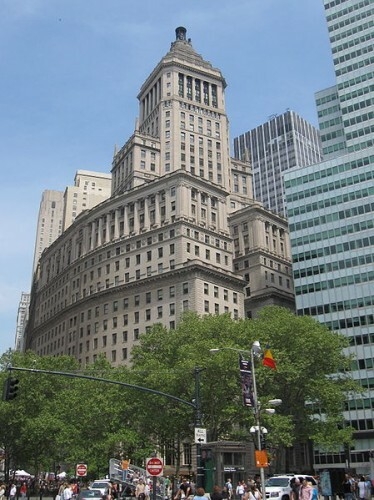 The landmarked Standard Oil Building at 26 Broadway continues to undergo its transformation from the oil giant’s Carrère and Hastings-designed New York headquarters into a bustling school building. Last week, AN got a sneak peek at the third academic institution to be completed there, a 104,000-square-foot space occupying the building’s first, mezzanine, and second levels. It will add 677 high school seats to the Broadway Education Campus, which currently includes The Urban Assembly School of Business for Young Women (on the 4th and 5th floors) and Lower Manhattan Community Middle School (on the 6th and 7th floors). All three schools have been designed by John Ciardullo Associates Architects, who have worked extensively with the SCA over the past several decades. Perhaps that relationship is why Ciardullo was allowed to have a bit of fun with the campus. As illustrated by the below photos, the underused interior mechanical courtyard is being transformed into a double-height gymnasium complete with a peaked skylight. The construction took a bit of maneuvering—not only with the Landmarks Preservation Commission but also with the new roof’s structural steel, which was slid into place through the building’s windows. John D. Rockefeller wouldn’t have imagined that students would someday play basketball within the walls of his Beaux Arts edifice, which he occupied from 1928 through 1956, but fortunately new pupils will see many of the original limestone and marble details intact in the school’s hallways, in addition to original elevator doors (now sealed shut) and brass light fixtures. Of course, the 29-story building’s upper floors are still marketed as posh office space, including Rockefeller’s own quarters, complete with historic woodwork and chandeliers.